Funding TROPICAL-ACS is an independent, investigator-initiated trial with an academic sponsor (Klinikum der Universität München). The trial was financially supported by a research grant from Roche Diagnostics (Rotkreuz, Switzerland) and a research grant from the German Centre for Cardiovascular Research (DZHK). Prasugrel purchase, drug delivery and related logistics were kindly supported by Eli Lilly and Company and Daiichi Sankyo Company. Funders of this study had no role in study design, collection of data and data analysis, or writing of the manuscript. Background Phenotype-guided de-escalation (PGDE) of P2Y12-inhibitor treatment with an early switch from prasugrel to clopidogrel was identified as an effective alternative treatment strategy in acute coronary syndrome (ACS) patients undergoing percutaneous coronary intervention (PCI). The Testing Responsiveness to Platelet Inhibition on Chronic Antiplatelet Treatment for Acute Coronary Syndromes (TROPICAL-ACS) Genotyping Substudy aimed to investigate whether CYP2C19 genotypes correlate with on-treatment platelet reactivity (PR) in ACS patients treated with clopidogrel or prasugrel and thus might be useful for guidance of early de-escalation of anti-platelet treatment. Methods and Results A total of 603 ACS consecutive patients were enrolled in four centres (23.1% of the overall TROPICAL-ACS population). Rapid genotyping (Spartan RX) for CYP2C19*2, *3 and *17 alleles was performed. Associations between PR and the primary and secondary endpoints of the TROPICAL-ACS trial and CYP2C19*2 and CYP2C19*17 carrier status were evaluated. For the PGDE group, the on-clopidogrel PR significantly differed across CYP2C19*2 (p < 0.001) and CYP2C19*17 genotypes (p = 0.05). Control group patients were not related (p = 0.90, p = 0.74) to on-prasugrel PR. For high PR versus non-high PR patients within the PGDE group, significant differences were observed for the rate of CYP2C19*2 allele carriers (43% vs. 28%, p = 0.007). Conclusion CYP2C19*2 and CYP2C19*17 carrier status correlates with PR in ACS patients treated with clopidogrel and thus might be useful for pre-selecting patients who will and who may not be suitable for PGDE of anti-platelet treatment. Regarding phenotype-guided treatment, we did not observe added benefit of genotyping to predict ischaemic and bleeding risk in patients who underwent a PGDE approach. Clinical Trial Registration URL: https//www.clinicaltrials.gov. Unique Identifier: NCT: 01959451. In the randomized multi-centre Testing Responsiveness to Platelet Inhibition on Chronic Antiplatelet Treatment for Acute Coronary Syndromes (TROPICAL-ACS) trial,  we recently established a regimen of anti-platelet therapy with an early switch from prasugrel to clopidogrel (de-escalation) guided by platelet function testing (PFT) as a safe and effective treatment strategy in invasively managed ACS patients. As both CYP2C19 genotype and on-treatment platelet reactivity (PR) (phenotype) impact on clinical outcomes,     the TROPICAL-ACS Genotyping Substudy aimed to investigate whether CYP2C19 genotypes correlate with phenotypes in invasively managed ACS patients treated with clopidogrel or prasugrel and thus might be useful and complementary for pre-selecting patients who may be suitable and who may potentially benefit from guided early de-escalation of anti-platelet treatment. All patients recruited for the genotyping sub-study were part of the TROPICAL-ACS trial. TROPICAL-ACS (ClinicalTrials.gov identifier: NCT01959451) was an investigator-initiated, randomized, parallel-group, open-label, assessor-blinded, multi-centre trial in ACS patients undergoing PCI conducted at 33 sites in Europe. It had an academic sponsor (Klinikum der Universität München) and was overseen by an independent data safety monitoring board. For the present multi-centre genotyping sub-study, genetic testing for CYP2C19*2 and CYP2C19*3 LoF and CYP2C19*17 GoF alleles was performed (see below). Inclusion and exclusion criteria were identical to those of the primary trial. In brief, biomarker-positive ACS patients aged ≥ 18 and ≤ 80 years after successful PCI were enrolled in the trial. Details on inclusion and exclusion criteria have been published previously. The genotyping sub-study, which was pre-specified in the study protocol, included a cohort of 603 consecutive patients from 4 German TROPICAL-ACS study sites. These were the Department of Cardiology, LMU Munich (Munich, Germany), the Department of Cardiology and Angiology II, University Heart Centre Freiburg, Bad Krozingen (Bad Krozingen, Germany), the Department of Cardiology and Pneumology, Heart Centre, Georg-August-University Göttingen (Göttingen, Germany) and the University Hospital Tübingen, Department of Cardiology and Cardiovascular Disease (Tübingen, Germany). As for all patients of the main trial, study enrolment and randomization of patients for this sub-study took place in the days after the index PCI. [Fig. 1] shows a flowchart of all patients enrolled in these four centres (with and without participation in the genotyping sub-study). Patients provided written informed consent for participation in this sub-study in addition to written informed consent for the primary trial. It was conducted in accordance with the principles of the Declaration of Helsinki and approved by the institutional ethics committee of each participating site. Fig. 1 Study flowchart. Study flow of the Testing Responsiveness to Platelet Inhibition on Chronic Antiplatelet Treatment for Acute Coronary Syndromes (TROPICAL-ACS) genotyping sub-study. PGDE, phenotype guided de-escalation. Before discharge, or with the outpatient visit on day 14 post-discharge, patients underwent rapid genotyping for CYP2C19*2, *3 and *17 with the Spartan RX assay (Spartan Bioscience, Inc., Ontario, Canada). The Spartan RX sample-to-result deoxyribonucleic acid testing system is a polymerase chain reaction-based bedside device using a buccal swab. The system was previously tested against bi-directional sequencing showing 100% agreement. Follow-up was identical to the primary trial. Two weeks after discharge, all patients had an outpatient visit that included blood sampling for PFT with the Multiplate analyser (Roche Diagnostics, Rotkreuz, Switzerland) under steady-state conditions. Details of this method have been published previously. A status of HPR was defined based on the consensus documents of the Working Group on HPR as an adenosine diphosphate (ADP) test aggregation value of 46 units or higher. Further on, patients were contacted by phone call at 30 days, 6 months, and 12 months after randomization. For study endpoints and adverse events, all source data were collected for independent event adjudication. The TROPICAL-ACS primary endpoint was a combined ischaemic and bleeding endpoint (net clinical benefit) consisting of death from cardiovascular causes, myocardial infarction, stroke, and bleeding grade 2 or higher defined according to the Bleeding Academic Research Consortium (BARC) criteria at 12 months after randomization. The TROPICAL-ACS key secondary endpoint was defined as BARC class 2 or higher bleeding events at 12 months. An independent and assessor-blinded event adjudication committee adjudicated all clinical events. Variables are presented as mean ± standard deviation or numbers (percentages). Binary and other categorical variables were compared using the chi-square test. For continuous data, two-sided unpaired Wilcoxon test or Student's t-test were used as appropriate. Normally distributed continuous data were compared between groups with one-way analysis of variance. Correlation between the primary and secondary endpoints of the TROPICAL-ACS trial and CYP2C19*2, CYP2C19*3 and CYP2C19*17 carrier status was evaluated by monovariate Cox proportional models. In addition, we tested for associations between CYP2C19 alleles and on-treatment PR by inter-group comparisons. A multivariable linear regression model was used to test for an independent association of CYP2C19*2 allele carriage with ADP-induced platelet aggregation measurements (dependent variable). Independent variables were CYP2C19*2 carrier status and age, gender, body mass index, diabetes, and smoking. Further details on randomization procedures and statistical assumptions were reported previously. Deviations between observed and expected allele and genotype frequencies for CYP2C19*2 and CYP2C19*17 were determined by means of Hardy–Weinberg equilibrium calculations. Data were analysed with R version 3.3.0. D.S. and T.G. had full access to the data and take full responsibility for the data presented here. Between December 2013 and May 2016, 2,610 eligible ACS patients with successful PCI were enrolled in the TROPICAL-ACS trial at 33 European sites. A total of 1,306 individuals were randomized to the control group and 1,304 to the guided de-escalation group. 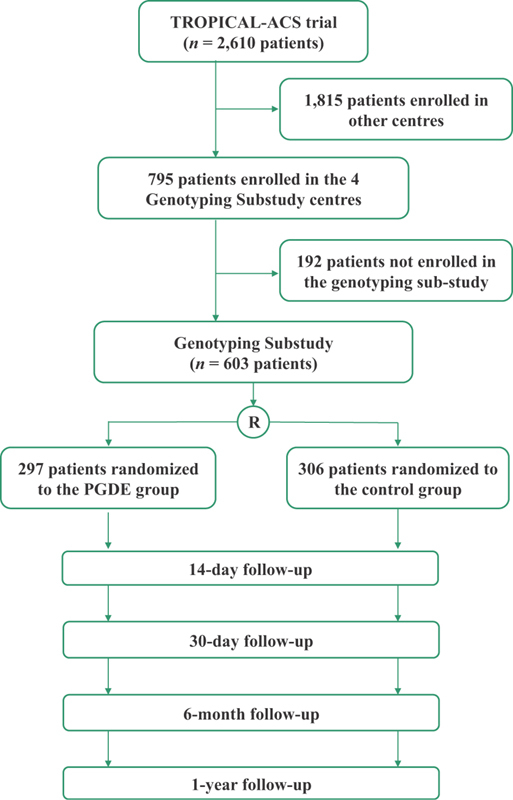 Of this intention-to-treat population, 603 consecutive patients from four study centres were enrolled to the genotyping sub-study between December 2013 and May 2016. Sub-study enrolment took place simultaneously to inclusion to the primary trial. The genotyping sub-study cohort consisted of 306 (51%) control group and 297 (49%) PGDE group individuals. Of the 297 PGDE patients, 90 individuals (30%) were switched back to prasugrel at 14 days' follow-up due to HPR on clopidogrel, as mandated by the study protocol. [Table 1] presents the baseline characteristics of the study population stratified by treatment groups. They did not differ between the PGDE versus control group. Angiographic and procedural characteristics are summarized in [Table 2]. They were equally distributed across study groups. Note that 169 patients (28%) were heterozygous and 17 patients (3%) homozygous carriers of the LoF CYCP2C19*2 mutation. The GoF CYP2C19*17 allele was present in 213 (35%) heterozygous and 19 (3%) homozygous carriers. As only 3 CYP2C19*3 allele carriers were present in the study cohort, these data were not included to further analyses. All genotype frequencies of CYP2C19*2 and *17 polymorphism were in Hardy–Weinberg equilibrium. Abbreviations: ACE, angiotensin-converting enzyme; ADP, adenosine diphosphate; SD, standard deviation. Note: Data are n (%), or mean (SD). Abbreviations: ACC, American College of Cardiology; AHA, American Heart Association; BMS, bare metal stent; BVS, bioresorbable vascular scaffold; DES, drug-eluting stent; NSTEMI, non-ST-segment elevation myocardial infarction; PCI, percutaneous coronary intervention; PTCA, percutaneous transluminal coronary angioplasty; STEMI, ST-segment elevation myocardial infarction; TIMI, thrombolysis in myocardial infarction. Note: Data are n (%). For the PGDE group, on-clopidogrel PR significantly differed across LoF CYP2C19*2 genotypes (p < 0.001) with the highest ADP-induced platelet aggregation values observed in homozygous *2 allele carriers and the lowest values found in wild-type individuals (mean PRwt/wt = 37.3 U, mean PRwt/ * 2 = 44.6 U, mean PR *2/*2 = 58.1 U, [Fig. 2B]). In the PGDE group, PR values also differed across GoF CYP2C19*17 genotypes (p = 0.05) with most effective platelet inhibition found for homozygous *17 allele carriers (mean PRwt/wt = 42.0 U, mean PRwt/*17 = 37.7 U, mean PR*17/*17 = 31.4 U, [Fig. 3B]). For control group patients, however, no association between on-prasugrel PR and *2 (p = 0.90) or *17 (p = 0.74) genotypes was found ([Figs. 2A] and [3A]). Ninety PGDE group patients (30%) and 28 control group individuals (9%) displayed insufficient platelet inhibition on anti-platelet medication defined as HPR. Of note, significant differences were observed for the rate of CYP2C19*2 allele carriers for HPR versus non-HPR patients within the PGDE group, with a higher proportion of CYP2C19*2 carriers among patients with insufficient platelet inhibition (43% vs. 28%, p = 0.007). Interestingly, 46% of patients with at least one CYP2C19*2 allele and no CYP2C19*17 allele had to be switched back to prasugrel due to HPR, compared with 27% of patients without altered alleles (p = 0.027), see [Fig. 4]. For patients with at least one GoF allele, the switching rates were similar to the group without altered genes, see [Fig. 4A]. Of note, 67% of the individuals carrying two LoF alleles had to be switched back to prasugrel due to HPR (positive predictive value 0.67, negative predictive value 0.71), compared with 38% of subjects with only one LoF allele present, see [Fig. 4B]. Finally, of the patients carrying two GoF alleles, no one at all had to be switched back to prasugrel (positive predictive value for clopidogrel maintenance therapy 1.00, negative predictive value 0.32), see [Fig. 4B]. In multivariate analysis, CYP2C19*2 carrier status was a strong and independent predictor of PR (p = 0.002). Fig. 2 Adenosine diphosphate (ADP)-induced platelet reactivity and CYP2C19*2 carrier status. ADP-induced platelet aggregation values stratified for 3 sub-sets of CYP2C19*2 carrier status for the control (A) and phenotype guided de-escalation group (B) at 14 days' follow-up. Wild-type (wt/wt) versus heterozygous CYP2C19*2 carriers (wt/*2) versus homozygous CYP2C19*2 carriers (*2/*2). The black bar indicates mean platelet reactivity. wt, wild-type. Fig. 3 Adenosine diphosphate (ADP)-induced platelet reactivity and CYP2C19*17 carrier status. ADP-induced platelet aggregation values stratified for 3 sub-sets of CYP2C19*17 carrier status for the control (A) and phenotype guided de-escalation group (B) at 14 days' follow-up. Wild-type (wt/wt) versus heterozygous CYP2C19*17 carriers (wt/*17) versus homozygous CYP2C19*17 carriers (*17/*17). The black bar indicates mean platelet reactivity. wt, wild-type. Fig. 4 Genotype status and switching rates in the phenotype guided de-escalation (PGDE) group. Changes of anti-platelet therapy within the phenotype guided de-escalation group in relation to CYP2C19*2/CYP2C19*17 genotype groups. (A) Group 1: patients with at least one *17 allele and no *2 allele. Group 2: patients with no *17 allele and no *2 allele. Group 3: patients with at least one *17 allele and at least one *2 allele. Group 4: patients with no *17 allele and at least one *2 allele. *17 = CYP2C19*17; *2 = CYP2C19*2. (B) PPV/NPV values in red relate to ‘high platelet reactivity (HPR)’” which prompted treatment changes with a switch from clopidogrel to prasugrel. PPV/NPV values in green relate to ‘No HPR’, leading to clopidogrel maintenance therapy. Abbreviations: LOF, loss-of-function; GOF, gain-of-function; PPV, positive predictive value; NPV, negative predictive value. A total of 53 primary endpoint events (net clinical benefit; death, myocardial infarction, stroke, bleeding BARC ≥ 2) were reported during the 12 months' follow-up period, see [Table 3]. In the PGDE group, where PFT (phenotyping) was used for tailored treatment, significant associations were neither observed between LoF CYP2C19*2 allele carriage and combined ischaemic events (p = 0.13), nor between GoF CYP2C19*17 allele carriage and BARC type ≥ 2 bleeding events (p = 0.83). Likewise, no significant associations were found for CYP2C19*2 genotypes with combined ischaemic events (p = 0.37) or CYP2C19*17 allele carriage with BARC type ≥ 2 bleeding events (p = 0.87) for the control group patients with uniform prasugrel therapy. Abbreviations: BARC, Bleeding Academic Research Consortium; CI, confidence interval. Note: Data are n (%). p-Values presented are for superiority comparisons. The present TROPICAL-ACS Genotyping Substudy is the first dedicated prospective analysis on the value of CYP2C19 genotyping for pre-selecting ACS patients for guided early de-escalation of anti-platelet treatment. Investigating complementary and useful methods and concepts in this regard seems mandatory, considering that early switching between oral P2Y12 inhibitors is common clinical practice worldwide,    and clopidogrel remains widely prescribed in ACS patients. One key finding of our study is that LoF CYP2C19*2 and GoF CYP2C19*17 allele carrier status in rapid genotyping correlates with PR in ACS patients treated with clopidogrel. Thus, CYP2C19 genotyping seems to be a valuable method for pre-selecting ACS patients who will and who may not be suitable for guided early de-escalation of anti-platelet therapy. Of note, we found evidence for a gene–dose effect with the highest ADP-induced platelet aggregation values observed in homozygous *2 allele carriers and most effective platelet inhibition with lowest PR seen for homozygous CYP2C19*17 carriers. Moreover, in multivariate analysis, CYP2C19*2 carrier status was a strong and independent predictor of PR, thereby emphasizing its role as a genetic marker that could be potentially useful for guidance of treatment (including de-escalation regimens). Importantly, our protocol mandated to adjust anti-platelet therapy based on PFT results in the PGDE group. Thus, we did not observe added benefit of genotyping for predicting ischaemic and bleeding risk in patients who in any case followed a PGDE treatment course, with respective therapy changes. Indeed, genetic testing, especially when performed as the 1st line strategy for guidance of P2Y12 inhibitor treatment, may represent an alternative approach to PFT to guide DAPT de-escalation. On-going clinical trials like Cost effectiveness of CYP2C19 Genotype guided Treatment With Antiplatelet Drugs in Patients With ST-segment-elevation Myocardial Infarction Undergoing Immediate PCI With Stent Implantation: Optimization of Treatment (POPular Genetics) and Tailored Antiplatelet Initiation to Lesson Outcomes Due to Decreased Clopidogrel Response After Percutaneous Coronary Intervention (TAILOR-PCI) (ClinicalTrials.gov Identifier: NCT01742117) will provide more insights in the future. With accurate and reliable bedside systems for rapid CYP2C19 genotyping newly and broadly available, physicians have innovative tools potentially helping with personalized therapy decisions at their disposal. This study represents one of the biggest ACS populations genotyped with the Spartan RX assay so far. It confirmed feasibility of rapid genotyping for the ACS setting. Of note, several institutions have started implementing CYP2C19 genotyping in PCI patients as part of routine clinical care        following the 2010 U.S. Food and Drug Administration boxed warning on clopidogrel stating that the drug has a reduced effect in patients based on their genotype, and subsequently developed experience and routine in using the respective assays. Importantly, for the PGDE strategy that implies a guided early (< 30 days) de-escalation regimen with intra-class switching of P2Y12 inhibitors in ACS patients, physicians at the primary hospitals need to carefully instruct patients about the necessary treatment change from prasugrel to clopidogrel 1 week after discharge, or provide them with pre-packed medication, and a follow-up visit for PFT is mandatory. This is time-consuming, and patients need to be fully compliant and definitely return to the hospital after 14 days. Especially in centres where CYP2C19 genotyping in ACS patients is already routinely performed, but also in others, rapid genotyping during the hospital stay can be a very useful, easy, and valuable tool for pre-selecting patients who will be suitable for guided de-escalation of potent anti-platelets. Our study provides evidence for a correlation between CYP2C19 genotypes and on-clopidogrel PR on the Multiplate analyser in ACS patients. For CYP2C19*2, Mega et al also described an association between carrier status and higher platelet aggregation values with light transmission aggregometry in response to clopidogrel among participants of the TRITON-TIMI 38 trial. For CYP2C19*17, another study in > 1,500 PCI patients showed significantly reduced ADP-induced platelet aggregation values in CYP2C19*17 carriers, and a genome-wide association study also provided evidence for a correlation between CYP2C19 genotype and platelet response to clopidogrel. For ACS patients treated with prasugrel, however, we did not observe an association between on-treatment PR and CYP2C19*2 or CYP2C19*17 carrier status. This finding is in line with large sub-group analyses from the PLATO and TRITON-TIMI-38 trials which showed that common CYP2C19 genetic variants did not affect drug metabolite levels, platelet aggregation levels, or clinical cardiovascular event rates in subjects treated with prasugrel or ticagrelor. Of note, two-thirds (67%) of the PGDE group individuals carrying two LoF alleles had to be switched back to prasugrel due to HPR, compared with none of the patients carrying two GoF alleles. Thus, rapid genotyping during the hospital stay can be a very useful and valuable tool for identification of patients who will and who may not be suitable for guided de-escalation of potent anti-platelets in the further course of treatment. Despite the good correlation between CYP2C19 genotypes and on-treatment PR seen in our study, the rate of CYP2C19*2 allele carriers in PGDE patients, who had to be switched back to prasugrel due to insufficient clopidogrel response, was only 43%. In the patient population presented here, the positive predictive value of homozygous CYP2C19*2 allele carriage for HPR phenotype in PFT, which prompted treatment changes, was 0.67. Thus, a significant number of ‘clopidogrel non-responders’ would have been missed with a sole genotyping approach for guidance of early de-escalation. This finding corroborates studies reporting that genetic polymorphisms account only for up to 12% of the variation in platelet aggregation in PCI patients, with other factors collectively explaining > 80% of the variation. However, the positive predictive value of homozygous CYP2C19*17 allele carriage for continued clopidogrel maintenance therapy was 1.00. Therefore, CYP2C19 genotyping seems to be useful for pre-selecting patients for the PGDE approach and seems to have an important complementary role in this setting, but cannot substitute for PFT for guidance of treatment. In this context, there is very limited evidence from randomized controlled trials for genotyping-guided individualized anti-platelet therapy in PCI patients with stable coronary disease or ACS so far. In the ARCTIC-GENE study, more than 1,300 patients of the ARCTIC population were genotyped for LoF and GoF CYP2C19 alleles. For this population, the genetic profile was a marker of response to clopidogrel in PFT but was not related to clinical outcome, suggesting that genotyping added little to the PFT information already collected for the main trial. Recently, a non-randomized study on genotype-guided anti-platelet therapy after PCI in 1,815 patients showed that the risk for major adverse events was significantly higher in LoF allele carriers treated with clopidogrel versus ticagrelor/prasugrel. The randomized Pharmacogenetics of Clopidogrel in Patients with Acute Coronary Syndromes trial recently compared an anti-platelet strategy that incorporated rapid pharmacogenomic testing for the CYP2C29*2 LOF, the CYP2C19*17 GOF allele, and the ABCB1 genotype with ‘standard of care’ in patients with ACS. The investigators planned to enrol a total of 3,612 patients, but prematurely stopped the study after enrolling only 888 patients due to regulatory issues with the rapid genotyping platform in Italy. At 12-month follow-up, the rate of the primary endpoint (cardiovascular death, non-fatal myocardial infarction, non-fatal stroke, and BARC type 3–5 bleeding) was significantly lower in the pharmacogenomic arm, driven primarily by a reduction in ischaemic events. However, the standard-of-care arm was significantly under-treated according to current guidelines, and the event rates in the standard-of-care arm were extraordinarily high. Moreover, the mechanistic basis of the findings remained unclear and the study was discontinued prematurely after only one-quarter of the planned study population was enrolled. Thus, this trial is significantly under-powered and may therefore largely over-estimate effect size. Hence, on-going clinical trials on the value of genotyping-guided individualized anti-platelet therapy may provide more insights on the topic. There are several large-scale and well-designed clinical trials on-going that aim to answer this question, e.g., the TAILOR-PCI (ClinicalTrials.gov Identifier: NCT01742117) trial, with an estimated enrolment of 5,270 patients with either ACS or stable coronary artery disease and an estimated study completion date of March 2020, or the Dutch POPular Genetics trial. In concert, these trials will provide important and interesting insights and may help answer the question of whether genetic testing alone could be useful for guidance of anti-platelet treatment in the future. We acknowledge limitations related to our work. One limitation of this prospective study is that our protocol mandated to adjust anti-platelet therapy based on the PFT results in the PGDE group. Thus, a relevant percentage of CYP2C19*2 carriers was switched back to prasugrel very early, which precludes conclusions about the impact of CYP2C19 genotypes on clinical outcomes with clopidogrel. Noteworthy, this analysis was not powered for clinical endpoints, making the real prognostic impact of the genotype difficult to judge. In conclusion, CYP2C19*2 and CYP2C19*17 carrier status in rapid genotyping correlates with PR in ACS patients treated with clopidogrel and thus might play a valuable role for pre-selecting patients who will and who may not be suitable for early guided de-escalation of anti-platelet treatment. However, we did not observe added benefit of genotyping to predict ischaemic and bleeding risk in patients who underwent a PGDE approach, with respective early treatment adjustments. Phenotype-guided de-escalation of P2Y12-inhibitor treatment with an early switch from prasugrel to clopidogrel was recently identified as an effective alternative treatment strategy in ACS patients undergoing PCI. In genotyping, presence of CYP2C19*2 and *3 alleles are established risk factors for ischaemic events with clopidogrel, whereas CYP2C19*17 carriers are exposed to increased bleeding risk. This study shows that CYP2C19*2 and CYP2C19*17 carrier status correlates with platelet reactivity in ACS patients treated with clopidogrel, with CYP2C19*2 as a strong and independent predictor of platelet reactivity in multivariate analysis, and thus might be useful for pre-selecting patients who will and who may not be suitable for guided de-escalation of anti-platelet treatment. Dr. Trenk reports personal fees from AstraZeneca, Bayer, Boehringer Ingelheim, Bristol-Myers Squibb, Daiichi Sankyo, Eli Lilly and Otsuka, Sanofi, outside the submitted work; Dr. Aradi reports personal fees from Roche Diagnostics, DSI/Lilly, AstraZeneca, Pfizer, Bayer AG, MSD Pharma, outside the submitted work; Dr. Sibbing reports grants from Roche Diagnostics and Daiichi Sankyo, during the conduct of the study; personal fees from Bayer AG, Daiichi Sankyo Eli Lilly, Roche Diagnostics, MSD, Pfizer, Astra Zeneca, outside the submitted work; Dr. Geisler reports personal fees from Astra Zeneca, Boehringer Ingelheim, Pfizer and MSD, grants and personal fees from Bayer Healthcare, Bristol Myers Squibb, Daiichi Sankyo, Eli Lilly, Medcines Company, Siemens Healthcare, grants from Spartan Bioscience, outside the submitted work. The other authors have nothing to disclose. The TROPICAL-ACS investigators thank all patients who participated in the trial. We also want to thank all investigators and study nurses for their valuable contribution. The valuable project management work of Monika Baylacher (LMU München) throughout the entire trial is kindly acknowledged. We also acknowledge the valuable work on data management by Katja Wendrich (TU Dresden, KKS), the work on study drug preparation by Andreas Thalmeier (LMU München) and technical assistance by Luis Pablo Hack (University Hospital Tuebingen). The Data and Safety Monitoring Board members were Albert Schömig (Munich, Germany), Helmut Schühlen (Berlin, Germany) and Martin Hadamitzky (Munich, Germany). The independent Event Adjudication Committee members were Jürgen Pache (Tutzing, Germany), Ute Wilbert-Lampen (Munich, Germany) and Dritan Poci (Sweden). Study project management was done by the Clinical Study Center (CSC) of Ludwig-Maximilians-Universität München (Munich, Germany). Study monitoring was done by an independent service provider, which was the Münchner Studienzentrum (MSZ) (Munich, Germany). The Steering Committee consisted of Steffen Massberg (Study chair, Munich, Germany), Dirk Sibbing (Study CI, Munich, Germany), Julinda Mehilli (Study Co-CI, Munich, Germany), Jörg Hausleiter (Munich, Germany), Franz-Josef Neumann (Bad Krozingen, Germany), Kurt Huber (Vienna, Austria), Daniel Aradi (Balatonfüred, Hungary) and Lukasz Koltowski (Warsaw, Poland). * Dirk Sibbing and Tobias Geisler are senior authors who contributed equally to the work. 55 Empey PE, Stevenson JM, Tuteja S. , et al; IGNITE Network. Multi-site investigation of strategies for the implementation of CYP2C19 genotype-guided antiplatelet therapy. Clin Pharmacol Ther 2017; DOI: 10.1002/cpt.1006.